And I also had to go because for 4 years I've been buying pudding from this kakak and her family. But believe me, this year, I couldn't find her anywhere.. until yesterday! So since today is my last day here before I go back to Penang yesterday, I just had to go buy her puddings. I got my favourite banana pudding and also got some peach pudding and kiwi pudding. Pity about this one is this kakak and her family only sell these pudding during Ramadhan..
Monday blues, reds, greens, yellows heheh..
Today is Monday.. so its normal to have the Monday blues. But what's not normal is to find myself in a dark room. Hah! I arrived at 10.05am after going for some petrol and topping up my Touch n Go for the festive season (wanted to go for some N2 for the tyre but there were way too many people at the place I usually go) and I arrived at school with NO ONE IN THE POSTGRAD ROOM! Semua orang dah balik raya.. and I'm bored! Was thinking of doing Dzul's tag, but kepale malas nak fikir 15 unknown facts about myself sbb macam semua dah diketahui jek heheh.. Sat down to calculate my expenditure and budget. Wanted to replace the timing belt and supposedly I'm able to do it this month (RM500.. gile tul!) but with raya around the corner and Adi's birthday this Sunday, rase cam postpone je. Lagipun the mechanic told me its actually good to go for a few thousand km lagi so leh relax skit. Lagipun, kang tak celebrate birthday my favourite brother tu, merajuk plak dia (Alasan la pulaaaaak, gune name Adi hahah..). Tambah plak lagi dah lebey kurang cam janji nak beli berpaket serunding for myself and for 3 friends yg nak gi oversea (Ashraf and Remy.. sorang tu kitorang terpakse la post sbb dia tak balik raye tahun ni.. cian Lie heheh..) Berkilo jugak la kan.. and RM pun berterbangan! Then kene renew my driving license (Eleee kemut, bukan mahal pun kan?! Kan?!) Mak oiii, my bank account suda kurus..
Then bukak pos Malaysia online to check parcel rates. The last parcel we wanted to send to Lie was charged RM320 haha.. giler! Sape suh gune courier. So this time the kakak² opis asked me to go check with Pos Malaysia for the rates.. tp heran, nape dlm byk² country, takde UK.. adeh la Pos Malaysia ni, tak update website ke? Now its 11.15.. huh? Baru 11.15?!?!?!!? It's gonna be a long day.. Anyway, it started last Wednesday as I came home from my tuition class to a 'dark' house. My mind suddenly flashed to the time when arwah Tok Hassan was still alive.. Whenever we arrived back at Kuala Kangsar, he'd take out all the pelita and place them all around the compound.. and our kampung being a true kampung complete with the vast compound, you can imagine how we loved it. My cousin, abg Sher was the fireworks master here while my brothers tagged along when he played with them. I was content with watching them through the big kampung windows we had at the house. I remember one year when Adi decided to do a project of his own. He was a true scout, eversince he was in standard 4 until form 5. Even when he had found other activites such as his silat, he was still a scout at heart. He decided to make his own panjut using bamboo. He was excited as well as Tok. I don't remember who but it was either Ikram or Iskandar who helped Adi a bit in the panjut-making process. But what I remember most is how Tok beamed. He kept telling me, "Ishh, kang gatal badan deme tu cari buluh tu kang.." But he couldn't hide the smile that was on his face to see his grandsons in the raya spirit. True, it was short-lived, but you should've seen Tok, raving about Adi's beautiful panjut for days after that.. In fact, for a while, I became a bit jelous hahah.. Anyway, smiling through that memory, I suddenly realized that THAT was what I needed. Something to remind me how special all of this was once to me. so the next day, I dragged Ad along to find some pelita. I didn't want the one with the stick because my rented house here doesn't have any soft soil for me to poke it into. I only wanted the normal pelita.. the aluminium kind being top of my list as that was what Tok's pelita made from, but I had to settle with the plastic ones. Ad just smiled watching her senior ke sane kemari singgah semua kedai sbb nak beli pelita hehe.. But the challenge was in finding the kerosene. Would you believe it, the house near my home and Pekaka DIDN'T sell any! Then I went to the quaint shops near the riverside, pun tak de.. Ughh, I was told back to come back the next day (takde jugak!) AND the next day (pun takde!) Sharil suggested I go buy diesel.. tp camne nak beli? Go to the pump attendent and say, "Saya nak beli diesel 2 ringgit, bley?" <-- Okay, ni cume alasan Ayu rase malu nak beli kat petrol kiosk. 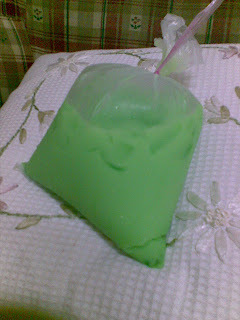 In the end, good ol' Bagan Serai (jauhnye beli minyak, Ayu heheh..) provided me with a whole litre of it. So on Monday (actually a bit early la for the Malam Tujuh Likur haha..), my house at least resembled a bit like my childhood.. and I was smiling like crazy throughout the night. What picture is this huh? Haha.. not many people might understand it, except a few of us.. You see, during Ramadhan last year, there was this person who was, you could say, obsessed with his air hijau Kulim. He had bought it one day at the pasar Ramadhan or somewhere and EVERYDAY he'd talk about it. And I mean it when I say he was obsessed. Sanggup tu pegi Kulim semate nak beli air ijau dia tu.. I teased him, telling him the mak cik air wanted him as her son-in-law so ade bace ape² la tu kat air tu but he just smirked at me and I continued to tease him till the end of Ramadhan. Tp pulak, the next day while I was malas² nak mandi before iftar, this guy called me and asked me if I was home. Ingat nape, upenye he wanted to send me some of his air hijau he just bought hahahah.. wanting to prove air tu sedap la tu kononnye hehe..
Should've known, still obsessed.. so I'm calling him menantu mak cik air ijau from now on! And to tell you the truth, agak betul jugak la kot, like bandung biase tp sedap sbb sanggup tu dia gi beli kat Kulim haha.. Kinda reminded me of the bandung hijau I did one Ramadhan which Pojie and Dgon refused to drink sbb kate Pojie, "PELIK!" Dgon last tu minum jugak la and ngaku pun my air tu sedap.. tp yg budak sorang lagi ni rasenye till the end tak minum my bandung hijau. Ayeen's tag.. thought of doing it yesterday tp since yesterday was hari marah, tak jadik nak buat.. But here it is, today.. sok buat Dzul punye plak. Not sure the entry on jejalan aritu nak buat ke tak ntah.. Right now ke ye? Hmm.. I'm not sure, doesn't seem like there's anything with neon signs saying, "Hey! We're important to you!!" in my head right now.. atau maybe my mind ni sudah blunt skit akibat mule berpuase semule hari ni heheh..
Serius tak paham soklan la Ayeen.. permanently owned?!? Jawab 'No comment' ala² celebrities aci tak? Aiyak.. restaurant? Dinner?! Actually for the past months byk dinner at home je.. My dapur suda berasap semula heheh.. but lemme think.. Hmm, rasenye at Secret Recipe Bandar Sunway ngan kak Shima 2-3 months back for iftar mase tengah lari dari exhousemate hehe.. The Way We Were by Paul apetah name dia.. butler for Princess Diana. Which reminds me, Choong, saya tak bayar lagi you punye duit for this book hehe.. I love them both.. and can't really state preferance here. Sensitive issue haha..
Hahah.. ni cam gaduh la plak. I really liked Britney's first album, bubblegum-like songs gitu. But Christina's 'mature' songs are great! Tu la Ayeen, I agree with you.. what kind of questions are these. But to me, hugs will do! 2. Bracelets.. simple, chunky, mahal, murah, glittery, plastic.. sumer suke! 3. Di mane ade makanan sedap, di situ ade Ayu hehe..
4. Beli greeting cards haha.. I usually stock up on birthday cards whenever I find cards I'd like and sometimes I'd spend hours just choosing cards that are nice and meaningful.. thats why my friends almost always get cards on their birthday ke ape ke because I have so many in hand.. and why some people who forget my birthday somehow always ask me whenever I don't send any cards to them.. ceh!! 5. Baking.. seriously! Give me an oven and I'd do lots with it :) Wpun tidak lah Ayu ni pandai masak, but anything to do with baking, I'd at least try once! 7. Teaching... ughh, bunyik cam poyo jek..
ii. Bongok! <-- Current fav word! Mostl I reread my old books je skrg as I haven't got time to go buy new books yet..
Lebih dari 8 ni.. camne? But currently Gone by Kelly Clarkson is on 'repeat' in my car. Bes ooo, form her 1st album I think..
i. Don't trust people too much. Sometimes, they're just using you.. then when you get mad, they pretend to be hurt just to make you feel guilty.. but 10 minutes later, they're back to their own tricks! iii. When hurt/mad, don't go running to the first person you see and spill it out the way you want it to sound. You might say something that would hurt other people AND that you can't take back because of your stupid ego. iv. When there are two sides of a story, listen to both.. and don't just go with the first version you heard! v. Do not do tomorrow, what you can do today.. yeah yeah! Its an old lesson.. and still I haven't learnt it yet hehe.. I keep having close calls which is quite bad. Takkan nak kene tersepit betul² baru nak learn the lesson Ayu oiiiii..
vi. Listen.. but sometimes, people need to hear you talk too so they won't have to listen to their own demons. Give them time to do that, then listen! Pagi tadi dtg school, dah plan dah kerja. Siapkan surat pasal penangguhan GA tu, then buat surat wang pendahuluan untuk FRGS Dr Farhan, pastu set meeting for Alumni PPKA next month and bincang ngan Wesam pasal CEC and AWAM 2009 tahun depan punye. Then dah plan, nak buat tag Ayeen or Dzul and one more entry pasal berjalan² ke Jusco smlm.. Dtg school dah sengih² dah ni..
Sampai kat meje, tgk ade titik² air nescafe/teh tumpah atas meja. Konpius gak, mase bile plak saya minum ni. Teringat gak Selase aritu mmg tak pose (oppppssss..!) and ade la minum air tin Nescafe (oppppsss lagik!!). Rase malu nnt kantoi, lap la senyap².. then..
Atas keyboard pun ade air tumpah..
Kat monitor pun ade ader terpercik..
Then surat dari IPS yg Dr Midi bg aritu pun kene tumpah air gak..
Abg Fadzil pun dtg menyiasat. Tatau sape the culprit tapi mase tu malas nak marah sgt so gelak² je ngan abg Fadzil tuduh dia.. Kitorg wat kesimpulan, ade la mangkuk I**n mane tah tumpang minum pastu tak sengaje tersembur.. Euuuuuwwwwww! Grrrrr, Incredible 'Ayu' Hulk telah muncul! Giler tul.. penuh dinding cube ngan air tu.. Bayangkan, bukan satu dinding cube tau, tapi penuh DUA dinding cube. Bongok giler! Mmg nak kene la sape buat ni.. sakit ati. Dah la saya mmg lekat kad² birthday org kasik kat dinding cube tu, abis kene. 'Sign' Happy Birthday Ayu yang Puga buat pun abis rosak kene air tu. Kotak² biru kesayangan pun abis kene. And nampak sangat dibuat dengan sengaja sebab penuh dalam cube tu. Dah la pi tuang kat PC ngan keyboard, memang bongok! Dan mulut Ayu seperti murai pagi tadi hehe..
Dah la geli sbb membayangkan.. ugghhh, tak yah sebut la. Tu Ramadhan ngan abg Fadzil punye bayangan hahaha..
Nway, pastu semua org tau la. Then Iz excited dtg tanye pasal 'case' baru ni.. dia kan skrg mmg agak berperang skit ngan diorg. Pas citer kat dia, dia gi balik cube dia and tak sampai seminit, kitorg dengar dia jerit..
Ape lagi, lari la kat tempat dia. Upenye lagi bongok.. ade org tuang air tu KAT DLM PRINTER DIA and kat PC dia jugak! Mmg cari pasal la org² padang pasir ni..
Then Dr Bad, Dr Azam and abg Junaidi dtg bilik ni (time ni org gi jejalan kat Pt Buntar.. opppsss lagi hehe..) and amik gambo sumer kerosakan. Diorang nak file kan report.. yeay!! <--Maksudnye, Ayu malas nak file report sendiri heheh..
Skrg ni cam dah sejuk skit.. tu pun sbb dapat nasik ganja idaman hati yg lame dah nak beli. Tp bile tgk cube balik tadi, ade gak skit rase geram kat diorg ni. Dtg tmpt org, hormat la skit, ini tidak! Cari pasal je..
Uhhh.. tatau la diorg ni! Harapnye esok hati ni takde la rase marah sgt dah.. penat oooo marah seharian. Cume ade rase bes skit sbb akhirnye parcel telah sampai ke tangan tuan(²)nye..
Aiiii, sabar lah wahai hati yang kurang sabar..
~ walaupun most people say I'm mild mannered, tu sebenarnye pandangan mereke yang tak penah kene penangan amarah Ayu hehe..
~ cakap byk tak benti.. padehal cam gelak tu jugak, dulu saya seorang yang boleh dikategorikan sbg pendiam. Kawan² lame sumer heran nape Ayu ckp byk skrg dan ini juge mungkin atas sebab menggantikan semula zaman² pendiam saya itu haha..
~ pemalas.. but that is not a secret dah kan heheh..
~ lebih negatif dari positif.. sungguh teruk bukan? ~ tak terbuka sgt.. tapi tak tertutup sangat jugak~ kate Amer, "kak Ayu lembap! 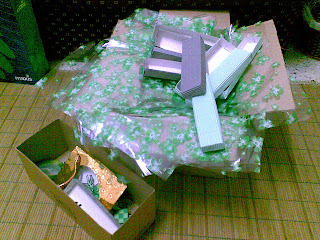 Karburetor lame lagik, tak tuko².."
~ a bit naive sometimes! ~ head up in the clouds most of the time! ~ kataaaaaakkkk!! Selalu terbayang jike TERcium katak, SAYa yg akan bertukar menjadi katak, dan bukanlah katak tersebut menjadi Prince Charming saya..
~ Ughh.. saya rase saya tiade kebolehan! 1. Bloghopping.. found out was tagged by Mael, Ayeen and Dzul hahah.. ade hati nak buat, tapi nanti la ye.. Wanted to comment on Ana's blog tp asyik tak leh je.. last week, Adi nye pun jadik camtu, nape ye? Dear fellow students and members of ACEPRO..
7.00pm onwards: Waiting for iftar and the feast itself. Then we will head to the Pusat Islam for Maghrib prayers. The iftar is on donation basis so you can give whatever amount you wish, but please be reasonable as I have been asked to remind you the cost per head is around RM8 and all the staff are also pitching in for this iftar. Another thing to be reminded is that this invitation is only extended to students and ACEPRO members ONLY. Those who wish to join or donate to the programme, please be in touch with me at the Postgraduate Room 1 (Room 1.25) before Wednesday, 17th September 2008 as the plans for the iftar must be finalised by the end of the week and the people in charge would like to know the total number of ACEPRO members that would be joining in. Thank you and have a blessed Ramadhan. 3. Wrote down addresse of friends whom I wanna send raya cards to. My address book outdated dah, and the latest address of friends are merate² in my cube! 4. Hmm.. thats about it hahah.. huh, giler! One hour and 20 minute and all I managed to do was those three things je.. ceh!!! 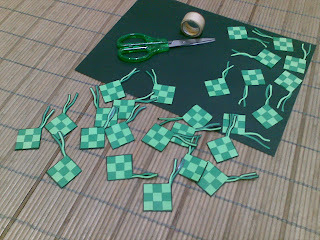 Nape Ayu buat ketupat tgh² mlm smlm? 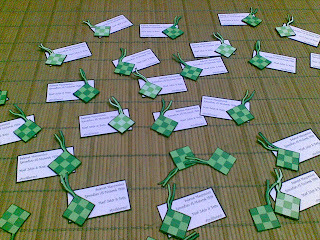 -->Ketupat betul I tak reti ye.. heheh..
.. ke 'My Bone and I' ek? Minggu lepas, USM telah menganjurkan satu program yang bertemakan tulang untuk menyemai kesedaran tentang kepentingan tulang.. Ohh, sungguh skema ayatku ini hehehe.. Anyway, last week lagi kak Hafsah dah bgtau, diorg buat free bone density check kat Pusat Kesihatan and menurut Pn Mas, klau buat kat luar, mau kene RM60. Kak Hafsah suruh la pegi.. dlm hati memang teringin pun, tapi jugek ade perasaan malas nak menapak ke Pusat Kesihatan. Bukan ape, my paternal grandma memang ade osteoporosis (memandai je eje, ntah ye ntah dak..). And risk is utk perempuan asian or caucasian and yang ade family history so name Ayu cam dah dicop² je kat risks tu. Mase Pah dulu, adeh, sekse tengok.. Bile uncles and aunties nak mandikan dia, menjerit dia bile diorang angkat dia.. so ade la jugak risau kan.. Tapi masih malas nak gi buat free check tu hehe..
Then Selase aritu, tgh duduk buat aktiviti biase bersembang ngan Remy sambil bergaduh ngan Ramadhan, then tetibe abg Fadzil masuk ngan excitednye..
"Kak Gee kate org Pusat Kesiahatan ade kat bawah utk check tulang.. jom²!" Soklan pertama dari Remy yang mabuk darah, "Depa ada ambik darah ka?" Reaction dari Ramadhan, "Kamu semua pergi dahulu, nanti bagi tahu sama saya tentang ujian itu, baru saya fikir mau turun atau tidak.."
Turun je bawah, dah beratur dah kak Hafsah, kak Ja, abg Mie, Wan.. dan paling depan sekali ialah Dr Sanusi. Memasing debo je tengok.. tp bile Dr Sanusi nye reading dpt dlm range 'Young Adult', adeh! Tak larat telinge sumer org dengar dia berbangge² haha..
Dia bg range normal as -1.0 to +1.0. Tu kire normal range la, tp sebenarnye all positive values to kire ok la.. cume biase diorg akan dapat reading dlm range tu. Then -2.5 to -1.0 tu pre-osteoporosis, and kene berjage² and start consume byk calcium but still ok. And -2.5 and below to kire risk la..
Kak Hafsah dapat 0.0 heheh.. seronok dia sbb katenye number dia cantik haha.. Then kitorang sumer beratur la nak try. Pastu turun la kak Su, Fisya and kak Zue jugak.. Yang tak bes tu, Dr Sanusi dok stick around tengok org len punye result jugak. Tatau nape rase tak mo org tau.. maybe sbb dlm hati dok rase cam bakal dpt -2.5 or below kot..
Sampai la turn si penakut darah tu. Abg Mie sume sibuk nak tengok sbb Remy pun sibuk pasal org len punye.. sekali, Remy dpt +2.5. Mak aiii, off the charts! Kat slip dia bg tu cume ade numbers -2.5 to +1.0 so Remy nye sampai tak leh nak tanda.. and as you can guess, berlagak abis la budak tu. Terpakse la kitorg dengar dia bgtau sumer org, "Aku punye ni, sampai tak dak ruang la nak buh.."
Last tu tengok dapat -0.7. Fuhhh.. 'Young adult' jugak w/pun berade dia dalam risky group.. syukur gak la.. cume kene ingat la, -0.7 tu dah dekat ngan -1.0 so Ayu, pasni minum soya byk² (Fresh milk konpem tanak minum nye.. the closest to milk is the Strawberry flavoured one hehe..) Ade la figurues lain in the slip like the bone stiffness value and bone density value tapi slip ku sudah hilang so tak dapat la nak share di sini. Yang bes tu, my value same je ngan Yee yang vegetarian (She's kinda risky gak sbb makan sayur je.. huhuhu.. ape maksudnye tu Ayu?!) Ad dpt -0.2.. and yess! Remy pun sibuk kitorg nye values sbb dia nak bandingkan ngan dia punye. Dr Fauziah dapat +1.0 and dia lepas tu trus nasihat kitorg on the do's and don'ts of eating heheh..
Save from a couple of years staying with my grandparents and a few more years tagging along when my father pursued his PhD, I've been living my whole life in Penang. I was born there, grew up there, went to school there.. and the list goes on. So because of this, I think I'm eligible to speak for all Penangites on how we've been missing out on donuts! No, its not those donuts the mak cik jual kuih sells where you could buy 4 at the price of RM1 (or is it 3 for RM1 now?). Its those ridiculously priced donuts, the colour of every shade in the rainbow and with all flavours imaginable.. yup, thats the one! You know, we don't even have Dunkin Donuts..
..so I wasn't suprised when Irnis asked me if I had tried the Big Apple Donuts and Coffee outlet at the new Jusco in Bandar Perda. This now-pregnant-again mum of Umar told me about the outlet with so many details that I felt like going there at once to try it out hehe.. Still, I'm not really a BIG fan of donuts. If I pass Dunkin Donuts on the RnR of Tapah or Sg Buluh, I might buy half a dozen of it but thats it. I won't go anywhere JUST to find donuts so after Irnis had gone home, the wanting-to-go-straight-to-Jusco feeling just faded away.. Anyway, last Friday, I decided to check out the new Jusco and since Bart was free, I thought I'd drop by her home to pick her up. While waiting for her to get ready, her mum kept talking about the said donuts, telling me how she loved them.. and this comes from a super chef! However, luck wasn't on my side. When we arrived, the queue was too long for my liking. Decided to go check on some jeans (Kak Zura had told me that one of my favourite brands were selling those jeans at RM29.70 after a 70% discount.. of course la I grabbed one! Hmm.. ok la, I bought two hahah..! Murah whaaaaattt!!) first THEN go check the queue. My tummy was grumbling by then as I hadn't taken my dinner yet and it was already 10pm so Bart told me there was another bakery which specialized in donuts that had just opened. However, she told me, after eating Big Apples, she didn't quite like this other place but since I was hungry, we decided to go there. It was called Nash Donuts (Bart said her friend told her it was under the Nasmir Nasi Kandar franchise.. dunno if its true or not!) 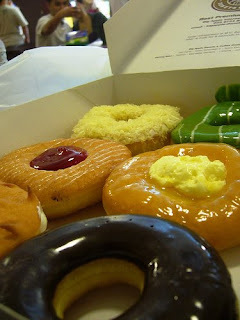 and had quite a wide variety of donuts even at 10.30pm. It also had a small corner for buns and bread but it was clear that the 'highlight' of the cafe was the donuts. We settled on 4 donuts after 'interrogating' the staff about the donuts. I chose the savoury ones consisting of this generously-covered-by-cheese donut and this chicken floss donut with lots and lots of that stuff on top. One thing about Nash, diorang tak kedekut! Then Bart took this Mango topped donut and a donut covered with melted chocolate and almond flakes.. okay, maybe one thing about this cafe, the donuts didn't have names.. or they might have names but the print was too small. Mostly, I just asked the staff about the donuts. I chose to wash mine down with an Orea Shake while Bart chose the ice blended Machiato. I took my first bite at the cheese donut and believe me, I fell in love at once. They had popped the donuts in the microwave for a few seconds so my donut was covered with oh-so-delightful melted cheese while Bart's chocolate+almond combo was very tempting after the chocolate was melted that way. Even Bart was suprised as she said, the last time she came here, the donuts weren't that good. My chicken floss one was good.. very good! While Barts mango one was ok² laaa.. but her choco+almond flakes one was simply.. whats the word? Divine.. ooohh, so Paris Hilton hahah.. I usually don't like pastries with almond flakes but this donut changed my view on almond flakes forever heheh..
By the time we polished off all our donuts, (I had already made up my mind to buy some for take-away and was sure I'd be able to do that as there were still huge amounts of doughnuts at the time we ordered!) the counter was almost clear. WhaaaaAAAaaT?! Sheesh.. there goes my take away! Told Bart, since she thinks Big Apple is way better than Nash's, I can't imagine how those doughnuts would taste..
..and so now we come to the events of yesterday haha..! Knowing that for the next month we'd be fasting, so no more food hunting during broad daylight (and at night time la jugak kan since we have our tarawikh), I thought, what the heck.. it now or exactly one month later, if I wanna try out the Big Apples donuts, that is! So there I was, alone (didn't feel like bothering Bart as I had planned to dash in to Jusco after that then rush home! ), and queuing up for half an hour awaiting my turn. I had arrived before 12pm but the line was already a mile long. I couldn't even read the donut choices as the board was way up front so I just sat quietly in the line awaiting my turn. When my time finally arrived, I was a bit stumped haha.. Not because there was so many choices, but because I was figuring out which donuts were least like the donuts I've tried before during my Dunkin-Donuts-at-RnR days. I finally settled down with 6 choices (Initially wanted to buy 3, but since I don't think I'm coming back here any time in the near future, might as well make it half a dozen!). Note: I 'stole' the picture below and above from the web. Didn't even THINK of snapping pictures as I was looking much more forward to tasting the donuts. This also explains why photos from Nash's Donuts also didn't make it into this blog hehe..
First and foremost was the famous Duren Duren where the filling is said to be made by fresh durian. I tasted it right after I got into my car (they said you should eat it within 3 hours of purchase) and ohhh la laaaa, was it divine (Paris Hilton again!). I though the dough was made of durian, turned out it was the filling: fresh cream with bits of durian. Very cliche when I remembered how I closed my eyes as I savoured the taste of this one hehe.. But seriously, sedap giler yang ni. Will definitly go buy this one again! Then I took Kiwi Blitz which is not exactly THAT different from my usual choices haha.. It had this white frosting then a dallop of Kiwi jelly in the middle. Still, the Kiwi jelly was tangy as a Kiwi should be and not like the Kiwi Jelly you find at some cake shops. 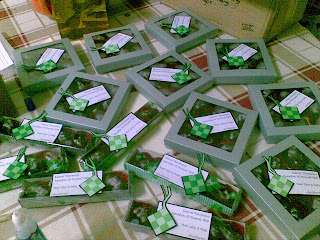 Next one was the Green Teaser that is supposedly made with green tea and sprinkled with sunflower seeds (?) but I couldn't actually detect the green tea in the topping.. it was nice though! Very zen hahah..
Another one that caught the Oreo lover in me was the Choreo. Very, very nice.. It had some fresh cream on top then sprinkled with lots and lots of Oreo crumbs! Yummy!! I won't go bored if I had to eat this donut with the Oreo cheescake from Secret Recipe and wash it down with the Oreo shake from Nash and Oreo+icecream thingey from McDs (Ya Allah, camne leh lupe name bende ni tah?).. so I guess, maybe I'm a bit biased on this choice, huh? Next one was Say Cheese which has white chocolate on top and sprinkled with cheese. I choose this because I have a weakness for cheese actually, explaining why I chose a similar donut at Nash's but Nash wins! Big Apple was a bit 'kemut' on the cheese, I tasted the white choc more and only had hints of the cheese so next time I want a cheese-themed donut, I'll go to Nash. I had wanted to try their Spicy Flossy but they were out of it. Plus, the picture they displayed didn't look even half as nice as Nash's..
Well, thats all I wanna say. 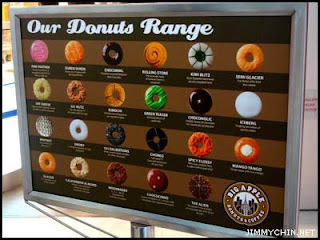 Now, I know where I can get donuts (as opposed to waiting when I use the PLUS highway la kaaaannn for my fix of donuts!) Ohhh, btw, Nash is much more cheaper. Big Apple is at RM2.20 a piece, and RM11.50 for half a dozen. Nash is RM1.60 per piece and RM9 for half a dozen.. but considering the choices they offer, I might just spend a total of RM20.50 for a box of half a dozen from each outlet hehe..